Energy Healing and metaphysical discussions. Personalized Affirmations just for you! Over the past 35 years, I’ve been asked, been given, or had suggested to me that I read an incredible amount of books on the subjects of metaphysics, self help, human potential and esoteric teachings. Most have been in the good to very good category. 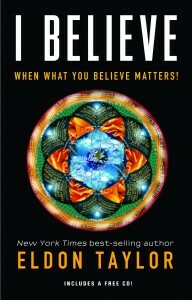 Eldon Taylor’s book, “I Believe ~ When What You Believe Matters!” is in the really very good group. Mr. Taylor is a best selling author and after reading this book, I can see why. His style is informal and easy to read, and yet you will get an amazing amount of information. This is not dull reading at all. “I Believe” centers around our beliefs, our belief systems and how we come to have them. Each chapter brings new information and new perspectives for us to look at and understand how it is we have the beliefs we do. The very first chapter asks us point blank, “Who Am I?”. From there, the knowledge that Mr. Taylor has gained over the last 30 years guides you through the labyrinthine trail of our beliefs and shows you, very clearly and precisely, how to change and let go of those beliefs that no longer work and serve you, and to replace those outdated ones with new, fresh, clear beliefs and belief patterns that do serve you. From our beliefs about God, to what is good and evil, to Unattachment, Enlightenment, achieving Balance, and many other belief systems, Mr. Taylor shows us how we come by them, and how to check if they are valid in this moment. At the end of each chapter, Mr. Taylor gives you a “reflection” for what you’ve just read and asks you go back over it and ask yourself the questions he poses. The answers you come up with may very well surprise you. This excellent Abraham-Hicks meditation CD and book is now available! This is The Message - It is your Soul talking to you. Hear what is has to say. Are you ready to let go of that excess weight and regain your energy?